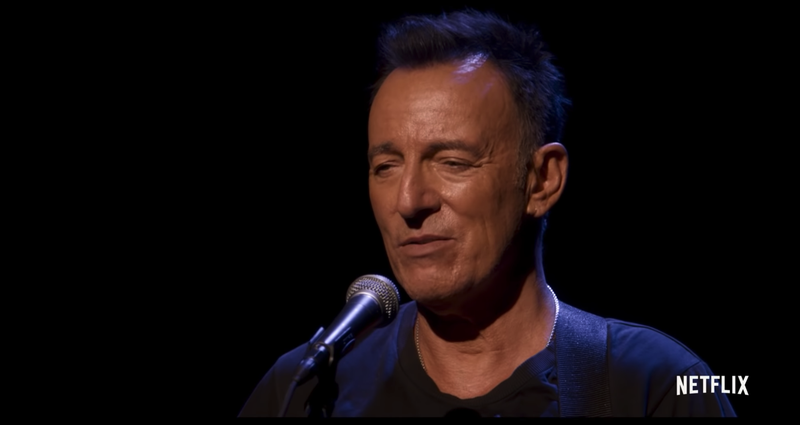 Tickets to Bruce Springsteen’s Broadway show, Springsteen on Broadway, would be an excellent gift for the New Jersey residents in your life, or perhaps for your father. Alas, they are sold out and are going for upwards of $3,498 on various ticket resale sites. That means this holiday season, you have a tough decision to make. Do you love your father that much? Do you love your uncle Chris from Maplewood enough to spend rent money on a sagging handbag man who could maybe still get it, depending on the lighting, the environment, and whether or not he had just sang “I’m on Fire” while sitting on a stool with a spotlight casting shadows on his decolletage? No? Sure. I get it. Maybe this Netflix special will get the job done, then. Here’s a little slice of Mr. Handsome Guitar Man talking story and singing into a microphone, as one does when they’re the Boss. He even trots out his wife, Patty Scialfa, so they can sing a song or three. This is basically the same experience as watching Bruce do his gravel thing in a t-shirt and black pants, but from the comfort of your soft couch, eating popcorn or perhaps a taco. It’s maybe better, though screaming BROOOOOOOOOOOOOCE at the top of your lungs in your living room isn’t quite the same experience as being shoulder to shoulder with your fellow fans at Madison Square Garden, but you know what? It’s a hell of a lot cheaper! "Bruce Springsteen: The Classiest Celebrity Cheater"